The last two years have seen an abundance of high profile crises hit major companies and a wide variety of industries. This includes the data privacy concerns with Facebook, an animal death on board a United Airlines flight, and sexual harassment allegations for on-air CBS and NBC employees. Like me, you may have thought “what were they thinking?” and been surprised that such large organizations did not handle their crises well. These events reinforce that crises can hit any group at any time, and every organization needs to be prepared with a crisis management plan. But where to start? Here are five key elements of a crisis management plan to keep in mind when putting your plan together. 1. Align the crisis communications plan with the operational plan. One of the first questions we ask a company when counseling on a crisis communications plan is to review all current policies, operations and emergency plans. While this may sound like a lot for background information, there’s a critically important reason – all these plans and policies have to work together! For example, you can’t have one notification process in the operational plan and a different one in the communications plan. This causes confusion and can lead to slip-ups during a crisis situation. 2. Assign crisis team members (and backups!) and know how to reach them. Speaking of the notification process, every crisis communications plan should have the necessary steps and contact information for notifying and convening your crisis communications team quickly. What’s more, this should include a backup person in the event the first contact is not able to be reached. In our connected world, I’ve been surprised how many times a team member is unreachable. It’s also important that the team is made up of leaders from across the company, including communications; human resources; environment, health and safety; operations; legal; customer service; and more depending on your company. It’s important that every function is represented in the crisis communications chain. 3. Know your risks and build those into your plan. Another central element of a crisis management plan is to identify the risks that your organization faces and conduct scenario planning for each. The main goal of this step is to find out if there are steps that can be taken now to correct the situation and avoid the crisis, if possible. Some situations are not preventable. In those cases, you’ll appreciate that you took the time during planning to think through likely scenarios. You’ll know what information the team needs to collect, what the initial steps are, and you’ll have an idea of how to communicate the news. This will help you react quickly to better meet the needs of your stakeholders. 4. Training can be difficult, but the alternative is worse. I can’t emphasize enough how important it is to train your crisis communications team on the plan once it is ready. There are many barriers to setting up a training – additional work to prepare the training, finding time on people’s schedule, or uncertainty within the team about its importance. In my experience, training has been invaluable – and not just during a crisis. Training the team on the crisis management plan, and walking through each step together, often identifies gaps in both the communication and operational processes. Such gaps could add another issue to the crisis if not addressed. 5. Crisis management plans have expiration dates. Our world changes quickly, and the elements of a crisis management plan can quickly become out of date. Your team members change, communication channels change, and the risks to your organization change. Be sure you have a process in place to regularly review and update your plan. The old saying is “an ounce of prevention is worth a pound of cure.” I’d argue that it’s worth more. If your crisis management plan doesn’t cover these five critical elements, its gaps could lead to high costs and significant reputational damage. Standing’s 2016 Reputational Risk Report found that the impact of a reputation-damaging crisis ranges from $100,000-$500,000 for immediate response actions. 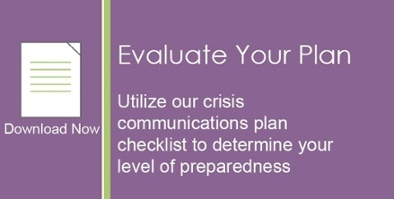 If you suspect that elements of your crisis management plan are not strong enough to handle a real crisis, download our Crisis Communications Plan Checklist. It will further help you identify weaknesses in your plan.